How does a nuchal cord relate to HIE? April 27, 2016 /in /by Reiter & Walsh, P.C. Babies are dependent on the umbilical cord for blood flow and gas exchange before birth. If the umbilical cord has issues, this can compromise the flow of gases into and from the baby. Nuchal cords (which are fairly common) occur when an umbilical cord is wrapped around a baby’s neck. Nuchal cords can cause hypoxic-ischemic encephalopathy, since they interfere with the flow of oxygen and nutrients through the umbilical cord. In some cases, nuchal cords pose no problem for long-term outcomes; in others, they can cause hypoxia and other complications. 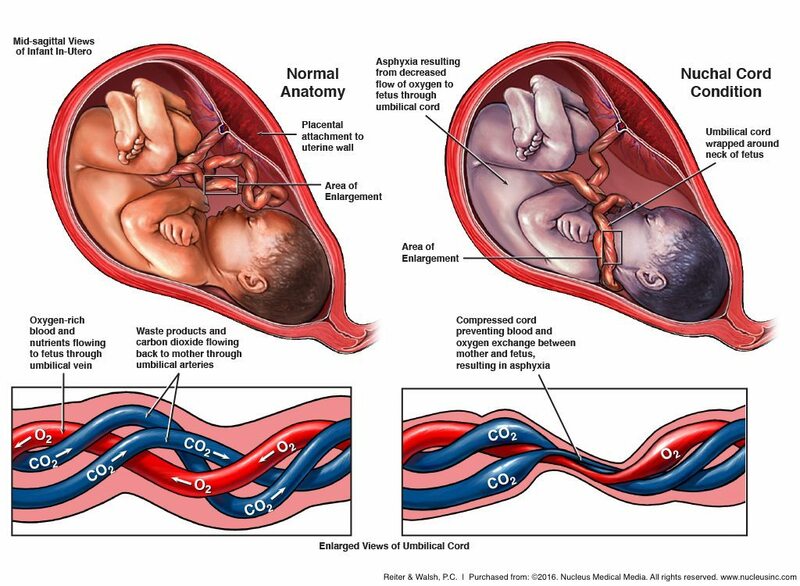 Nuchal cords can lead to ischemia (restricted blood flow) and/or hypoxia (decreased oxygen levels to the baby’s vital tissues and organs) when the umbilical cord becomes partially or completely compressed. This means that the umbilical vein (which brings oxygen-rich vein to the baby) and the umbilical arteries (that bring deoxygenated blood back to the mother) are also compressed. Nuchal cords can also congest venous blood flow, and compress the baby’s neck’s major blood vessels, hindering proper blood flow. HIE is encephalopathy (brain injury) caused by a hypoxic-ischemic event. Nuchal cords can be the direct cause of hypoxic-ischemic encephalopathy in a baby. Nuchal cords can be diagnosed with ultrasounds during pregnancy, with 83% of nuchal cords visible via color Doppler. A nuchal cord may cause non-reassuring fetal heart tracings. Proper diagnosis and prompt preventative measures are key to preventing adverse outcomes from nuchal cords. There are standards of care in place that medical professionals should follow in providing care to mothers and babies impacted by nuchal cords. If a medical professional doesn’t follow these standards of care and the child suffers an injury because of the physician’s actions, this is medical malpractice. Call our experienced birth injury lawyers today for a free consultation at (888.812.6009), or use the live chat button to your left to speak with us 24/7. We can review your medical records and determine whether your child’s injuries were due to medical malpractice.